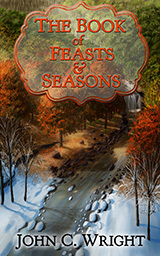 THE BOOK OF FEASTS & SEASONS is a beautifully mind-bending stroll through the calendar. Over the course of the year, from January to December, the author takes his inspiration from ten different holidays and explores their possibilities in a series of stories of marvelous imagination. The book begins with New Year’s Day and “The Meaning of Life as Told Me by an Inebriated Science Fiction Writer in New Jersey.” The Feast of the Annunciation of the Blessed Virgin is represented by “A Random World of Delta Capricorni Aa, Called Scheddi”, while “The Parliament of Beasts and Birds” is the story for the Feast of Pentecost. The calendar, and the anthology, culminate on Christmas Eve with “Yes, Virginia, There is a Santa Claus”. John C. Wright is the one of the living grandmasters of science fiction and the author of The Golden Age, Awake in the Night Land, and City Beyond Time: Tales of the Fall of Metachronopolis, to name just three of his brilliant books. Unlike most science fiction authors, he is a deeply religious man and a devout Catholic philosopher who regards reason as an intrinsic aspect of his faith. THE BOOK OF FEASTS & SEASONS is an imaginative embodiment of that faith taking many different shapes and forms throughout the vast expanse of God’s Creation. EPUB and MOBI for Kindle format. No DRM. 185 pages.